Allan Hackney, the state’s health information technology officer. The idea of a single health information exchange across the state of Connecticut seems simple: Gather all health information in one place and make it available to every practitioner involved with a single patient to provide the best care possible. Unfortunately, in Connecticut this process has been anything but simple. Instead, it has been enormously expensive and time-consuming — costing the state $23 million and 11 years of work which, to this date, have yet to produce an exchange. This has been frustrating for everyone tasked with improving patient care and has led to multiple attempts by providers, such as non-profit hospitals, to create their own systems for exchanging information. The stakes for making this work are undisputedly high. Experts agree that the ability to exchange patient information across the health care spectrum — from hospitals to private providers to pharmacists and beyond — reduces medication and medical errors, improves data collection on health outcomes, and reduces costs. Since 2007, that has been the goal of the state and the much-anticipated wish of providers throughout Connecticut, driven not only by the desire to provide better care for patients but also by the promise of financial incentives. Federal incentives – such as those given by the Centers for Medicaid and Medicare Services – are now based on outcomes data. Therefore, practitioners and hospitals can only receive payment if they can prove that what they are doing is reducing hospital readmissions and improving the quality of care. A health information exchange not only allows for better care in the moment, but the collection of data to show what the care achieved. For all of those reasons, there has been an abundance of both public and private efforts to create a health information exchange in Connecticut over the past decade. As the state moves forward with its plan to try, for a fourth time, to build an exchange its efforts are complicated by the march of time — namely, that the landscape of health information technology has become more complex and populated by many, disparate efforts that need to be integrated into one, seamless whole. In 2007, Connecticut launched its first attempt to create a health information exchange (HIE), specifically for Medicaid patients, with a $5 million grant. This was before most physicians had switched to electronic health records, however, and although the effort was cutting edge, the state’s medical professionals weren’t ready for it, said Dr. Thomas Agresta, a professor and director of medical informatics in family medicine at UConn Health, who has been involved in HIE efforts since the beginning. 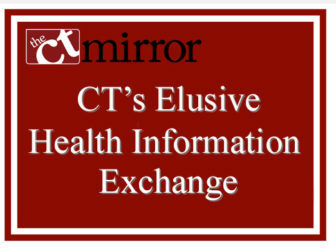 In 2011, the state made its second attempt, this time through the Department of Public Health (DPH) and a quasi-organization, called the Health Information Technology Exchange CT (HITE-CT). The organization had two full-time employees and a board of directors – including the commissioners of the state departments of Social Services and Public Health – who guided decision making. HITE-CT contracted with Axway Inc. in 2011 for more than $6 million to construct the provision, licensing, maintenance and support of a statewide HIE. The contract, however, did not go as planned. 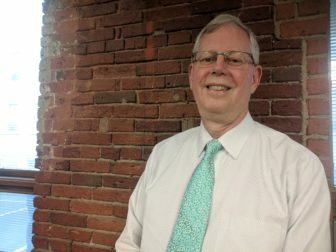 “They entered into a contractual agreement to implement a health information exchange, but didn’t have full buy-in from stakeholders to use the technology,” said Mark Raymond, chief information officer for the state, a member of the Health Information Technology Advisory Council, and the final chairman of HITE-CT’s board of directors. By the autumn of 2012, Axway had filed a claim against the contract and HITE-CT had more than $2.5 million in unpaid invoices from Axway. According to Department of Social Services (DSS) Commissioner Roderick Bremby, who was on the board of HITE-CT at the time, the lawsuit was filed because HITE-CT would no longer be operating and thus may not pay out the full contract. “It was clear that the HITE-CT board had decided to cease operations because it did not have the resources in order to continue operating,” Bremby said. “It was a quasi- governmental organization so it could decide to stop operating,” even though it was still mandated under state law to produce a health information exchange. “If HITE-CT was no longer going to operate then [Axway] wanted to make sure that they got paid,” said Minakshi Tikoo, the Health Information Technology Coordinator for DPH at the time. Despite her title, Tikoo was not in charge of the HITE-CT effort; instead, she was hired to evaluate its progress. In January 2013, Axway sued HITE-CT for non-compliance with the terms of the contract. An agreement was reached before the end of the year, but it reduced the work Axway would be doing to a provider registry and an enterprise master patient index. These two products are operating today under DSS. By 2014, HITE-CT still had no functioning network and was having trouble garnering enough trust and enthusiasm from stakeholders to become sustainable and pay the state match on the federal grant DPH had received, according to a report written by Tikoo. On July 1, 2014, the legislature shut down HITE-CT and transferred all responsibility for creating an HIE back to DSS. The state, however, was still responsible for paying the matching funds it owed on the $7.29 million loan. Although Tikoo identified many possible reasons for the organization’s failure, including HITE-CT’s inability to attract stakeholders and develop a sustainable source of funding, no one involved with the past effort is able to explain what went wrong. The state has been taking many years and spending lots of tax payer money and has nothing to show for it. There were two full-time employees in charge of day-to-day operations of the HITE, in addition to the board. One of those positions was the chief technology officer — a position which changed hands three times — the other an administrative assistant. David Gilbertson and John Destefano served as the chief technology officers for HITE-CT. Gilbertson served from November 2011 to August of 2012. Destefano — not to be confused with the former New Haven mayor — served from May 2012 to November of 2013. Neither could be reached for comment this week. The third attempt, which DSS began in 2016, is when many in the state hit a wall of frustration, according to Bremby. Neither the second or third attempts produced a functioning system, despite extensive planning and $18 million in funding combined. “We were authorized to implement a statewide HIE, the third attempt by the state, and it only lasted 10 months. A mere bite at the apple for 10 months to develop an HIE,” Bremby said. During those 10 months, Bremby’s agency put a plan together to construct some of the basic, foundational components of a health information exchange and submitted it to the Office of Policy and Management (OPM). That plan – which included Project Notify, Patient Navigator and Provider Registry, all Medicaid-based initiatives that tackle one small aspect of health information exchange – was later approved by OPM and granted funding. The legislation to create the HITO position, however, called for work on the health information exchange to cease completely until a HITO was hired. Therefore, the effort was suspended for more than six months, from May 2016 to January 2017, until Allan Hackney was hired. “We turned our attention back to what we had already submitted to OPM during that 10-month period,” Bremby said. The agency’s attention has stayed there, on Medicaid, while the HITO and Health IT Advisory Council have grappled with the problem of establishing a health information exchange. Twenty months into the state’s fourth attempt to create an HIE, everyone is again starting to feel the pressure to produce something while frustration mounts that a complete health information exchange is still in the future. “There is this tension between thoroughness and action. Perhaps in our decision-making process that needs to be considered,” Raymond said during a recent board meeting. And that decision making process is shaped by the mistakes of the past. The Connecticut State Medical Society’s CTHealthLink, the Connecticut Hospital Association’s PatientPing, and exchanges allowed through medical record companies such as Epic that are used by hospital systems have all increased the exchange of health information throughout the state since the first effort to build a HIE began, but they have also complicated the state’s efforts. State officials understand that hospitals, private practitioners, and other medical groups have already invested in their own systems and no longer need one complete health information exchange that will replicate what they have already created. Instead, Alan Fontes, the director of UConn’s Analytics and Information Management Solutions, said that health care providers are looking for a way to connect what they already have in place. The missing connections will be built one at a time, with the most immediate priorities tackled first. The Health IT Advisory Council has been planning this approach, connecting with stakeholders across the health care industry and planning the priorities to target first. The council has spent $5 million so far, drawing from a $10 million pool of combined state and federal funding. Far more funding than this will be needed to implement the full plan, however. The HITO and the Health IT Advisory Council, along with DSS, received a much-needed $12.2 million grant from the Centers for Medicaid and Medicare Services (CMS) earlier this month. Hackney said his top two priorities are to construct an electronic clinical quality measure system (ECQM) that gathers data and measures the quality of health care, and encounter alerts that would notify all parties involved with a patient when they are discharged, transferred or admitted. However, unlike the failure of HITE-CT, the state now has a plan to pay the match in any federal grant. As the state moves forward with its plans, however, the Connecticut Hospital Association (CHA), the Connecticut State Medical Society (CSMS), and others are not stopping work. In early 2016, just as the third state attempt to construct an HIE was getting underway, CHA began working with PatientPing — a Boston-based care coordination network that connects health care providers. Together, PatientPing and CHA designed and developed a system to enable real-time information sharing across all members called the Cross-Continuum Patient Reference System. “We were trying to solve the fact that there is still no HIE. We took the lead to develop a mechanism to do just that,” said John Brady, vice president of business planning for CHA. The system covers 25 hospitals in Connecticut and about 350 post acute providers and Accountable Care Organizations. It allows everyone connected to the system to track patients as they move from provider to provider and gives them information about the patients’ primary diagnoses. These notifications not only provide context around visit history, but also provide contact information for previous providers. “The aim was to better coordinate the care of patients, and overall improve care for patients,” Brady said. The system has also allowed for data collection and analyzation – a key aspect of health information exchanges that the state intends to include in its system in order to track health outcomes. The system is similar to DSS’s Project Notify, except for three key differences — the most notable of which is that Project Notify is only available for Medicaid patients. This means that while Medicaid participants are enrolled for free, other users would need to pay in order to be a part of the system. Project Notify, unlike PatientPing, is also capable of alerting providers across the health care spectrum by computer, EHR, or telephone, whichever works better for them, and does not require the enrollment of any participants. All medicaid participants are automatically enrolled. However, Project Notify is starting out just one facility at a time. The first user was Yale-New Haven Health in February of 2018. Again, this is a slow build, but it is in operation and we have a phase two,” Bremby said. Brady confirmed that although PatientPing is continuing to expand within Connecticut by adding more members, CHA is also in contact with the HITO. Brady also said that CHA’s members are already sharing copious amounts of data through their EHR systems – including Epic, the largest provider in the state – which allows for charts and notes to be requested and transferred electronically between hospital systems. According to Gordon that transfer is not always easy. In his role as president of CSMS, Gordon helped establish CTHealthLink, the state’s first complete health information exchange last summer. It is a health information exchange in the traditional sense of the term – a hub for all healthcare information – but, as of today, only three private practice groups subscribe and no hospitals have expressed interest. Despite its small scale, CTHealthLink has information flowing. “We are currently working to connect disparate systems together to provide a seamless transition to practices that have partnered with CTHealthLink. As one can imagine, this is not as simple a task, but we anticipated EHR road blocks and have been confidently working with experts…to provide the most efficient service to our partners,” said Matthew Katz, chief executive officer of CSMS. Road blocks and slow but persistent progress have been the hallmarks of nearly all large-scale HIE efforts across the country, said Baker, of the Connecticut Health Foundation, and other experts. Fast, quick and easy results simply do not exist in this field, but the importance of establishing such a system has kept everyone working. “It is a gateway and absolutely important for quality care, for quality improvement, and for accountability,” Baker said.